Originally founded in 1898 by James Lansdowne Norton, the Norton Manufacturing Company produced bicycle parts. Yet, with a level of engineering savvy, James quickly moved into the motorcycle market. In 1902 Norton began manufacturing motorcycles. The first motorcycles used an aftermarket engine made in France and Switzerland. Then in 1908 they began using an engine of their own, and Norton was on its way. During World War Two, Norton exclusively focused on supporting the war effort by building two motorcycles: one with a side car and one without. Norton contributed over 100,000 motorcycles to the war effort, according to Motorcycle Search Engine. after the war was over, Norton quickly turned its focus back to the public market and to motorcycle racing. Throughout the late 1940s and early 50s Norton dominated Isle of Man races and others. This helped develop Norton as a favorite among the Café Racer set. And, in 1968 Norton released the 750 Norton Commando, the last twin piston-engine motorcycle the company would release. The Commando turned out to be one of the most well-known models the company produced. During the 1950s Norton experienced some financial difficulties and was bought by Associated Motor Cycles (AMC) in 1953. AMC at the time was producing the Matchless and AJS motorcycles, and the acquisition of Norton was considered to be a benefit to the company at the time, as Norton was the largest selling motorcycle brand of the combined company. AMC closed and moved the Norton factory to consolidate production, yet left most of the Norton management in place. AMC made numerous improvements to the Norton models, but sales for the company overall were still down. AMC went out of business in 1966, and was formed into Norton-Villiers. Like BSA and Triumph, Norton was hit hard by quality problems and the import of Japanese motorcycles into the U.S. market. Honda and the other manufactures were importing more reliable and better priced motorcycles, while British manufactures dealt with mismanagement, labor issues, and problems with quality. In 1973 the British government intervened in an attempt to save the companies and forced the formation of Norton-Villiers-Triumph (NVT), which included BSA, Triumph, and the remnants of AMC, including Norton-Villiers. The merged company did not last into the 80s and the company was liquidated, leaving each brand to fend for itself. Norton spent the 80s and 90s in a series of battles over rights and ownerships, launches and revivals, and many dead-on-arrival attempts at relaunching the brand, one of which was spearheaded by Kenny Dreer out of Portland, Oregon. His company began restoring older bikes before Kenny attempted to release a newly designed Commando in early 2000. Yet, as with many of the Norton revival attempts, Kenny’s motorcycle never saw a full production release, and he closed down in 2006 due to funding issues. 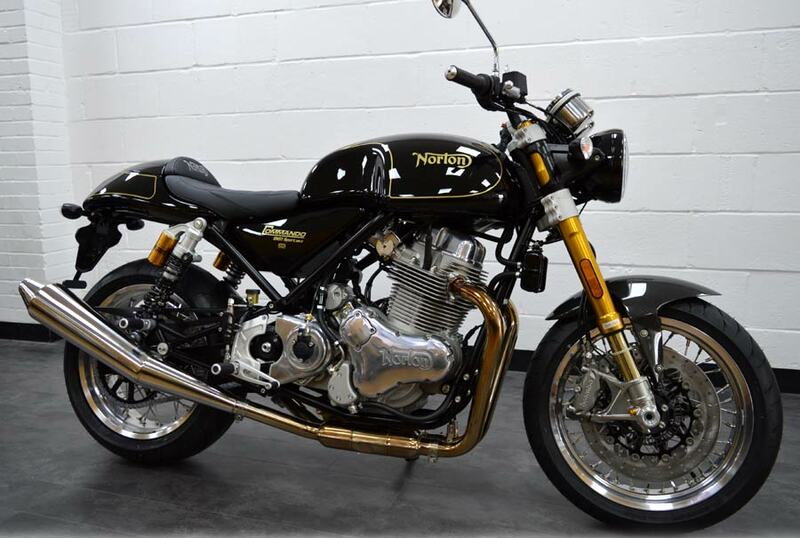 Numerous companies over the years have attempted to revive the Norton brand, an one appears to have succeeded. In 2008 Stuart Garner managed to acquire all the rights to the Norton brand. He quickly built a factory and recruited the engineers and leadership team to get the new Norton built. According to Throttle Hand, the first Commando available for sale in roughly 30 years was sold on March 29, 2010 to Hewitt from Grimsby, South Humberside, U.K. Even though Norton has a limited production of motorcycles at this time, they are slowly adding models to the line-up and increasing production, now offering three motorcycles in the line-up. The latest is the Commando 961 which has a two-valve 961cc fuel-injected parallel-twin engine. All motorcycles are designed with the Café Racer in mind, offering a stylish and classic looking motorcycle with a modern engine and performance.